NORTH ATTLEBORO, Mass. – In a battle of two of the top teams in the Hockomock League, King Philip flexed its offensive muscles against North Attleboro, starting with a big first inning and never looking back. The Warriors plated six runs in the top of the first inning on its way to a 16-2 decision over the previously undefeated Rocketeers. The offense started with the first pitch of the game — a line drive single from Sydney Phillips into left field — and continued throughout the opening half inning. Although Big Red had a chance to get Phillips at second for the first out, the Rocketeers were deemed to have come off the bag, giving KP first and second. After a long at-bat, Meghan Gorman drew a walk to load the bases. North sophomore Bella Erti got the first out via strikeout but KP junior Faith Turinese drove the first pitch she saw into the outfield for a two RBI single. After another strikeout, Elise Pereira stepped to the plate and launched the first pitch of the at-bat well over the center field fence for a three-run home run. The Warriors offense wasn’t done yet as Jess Bonner followed that up with a solo shot of her own to make it 6-0. “I think everything we did was pretty impressive,” said KP head coach Norm Beauchemin. “We have a formidable lineup, one through nine we don’t have a weak spot. There’s a reason why the kids are where they are at in the lineup. Pereira kept the momentum with King Philip by retiring the Rocketeers in order on just seven pitches. Pereira earned the win in the circle for the Warriors, allowing just three hits over seven innings of work. She struck out six and had just two walks. King Philip cashed in again with two outs in the top of the second inning. Gorman (4-for-4, five runs) reached with a single. Liliana Rolfe hit one to center that ended up getting through the fielder’s legs, and with Gorman already running on the pitch, the junior was able to get home to make it 7-0. Annabelle Hebard drew a one-out walk for North in the bottom of the second but Pereira quickly got two outs to get out of the inning. North Attleboro got on the board in the bottom of the fourth inning. Ashley Cangiano reached with a two-out single and advanced to third when the ball got away from KP’s outfielder. The sophomore then came home when Erti grounded to first and the throw to try and get the out at home was in the dirt. But before North Attleboro could get any more momentum, King Philip’s bats came back to life. After being silenced for two innings, KP scored in each of the final three innings. In the fifth, Gorman doubled, advanced to third and then scored on an outfield error. Pereira then launched her second home run of the day, again to deep center, this one a two-run blast to put KP up 10-1. In the top of the sixth, Hailey McCasland (single) scored on a sacrifice fly from Turinese, and Gorman stole home after a steal attempt at second was gunned down by Cangiano, North’s catcher. And in the top of the seventh, the Warriors tacked on four more runs. Pinch hitters Reagan Simeone and Destine Goyco each singled. McCasland then drove both in with a two-out single and scored on a base hit from Gorman. Gorman then came around to score on a hit from Allie Kuchy. Big Red added another run in the bottom of the seventh when senior Olivia DesRoches belted a pinch-hit home run over the fence. 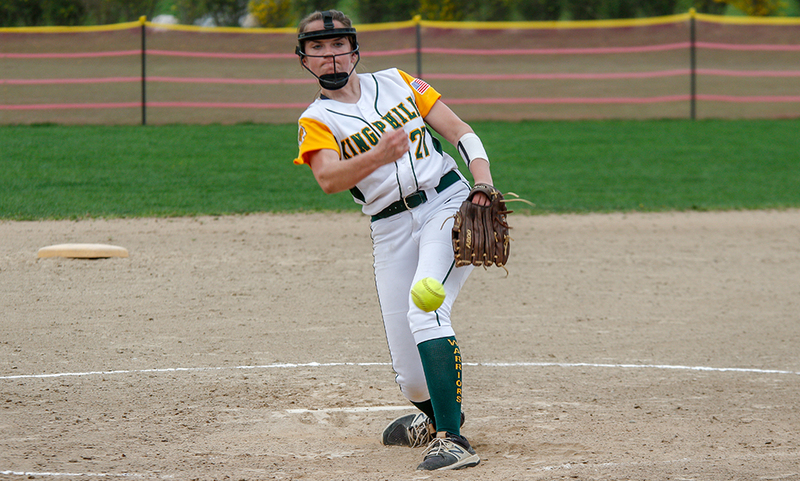 King Philip softball (7-0 Hockomock, 8-2 overall) is back in action on Monday when it hosts Attleboro. North Attleboro (6-1, 7-1) will try to bounce back from its first setback on the same day when it welcomes Canton.